Gary's love of sport started very early and continued to grow with each passing year. He joined many football clubs but because of his special ways he was bullied in almost every club. He stood up to these people and it was his firm and honourable stand that made him a target. He believed that "each person was entitled to be how God made them and they should be able to enjoy the freedom to live life." 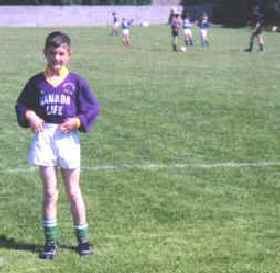 I remember Gary went to watch his brother Stephen play football. Gary brought a ball to kick about with his sister Lisa. This was enough for the bully's to start. Gary continued to play with his sister and never showed annoyance. I quote again from Gary "keep your head high and never mind them". This Gary managed to do all his life, because of the strength and courage "Gar" had. Gary shall always be our inspiration and guide through this life. He would not dwell on the above. It was football he loved most. He first supported "Aston Villa" football club. Quickly realizing that nobody supported Aston Villa he moved to "Spurs". The team lost on many occasions and we all enjoyed the fun around the table at meal times " keeping him going" about "the losers". Gary later supported Liverpool Club. At last a team that could win some games. My knowledge of the game is very limited, Gary was the expert of facts, figures, rules and regulations. This included football team around the world. He also had a love for all sports. Gary had a goal in life that he would one day become a football commentator. He wrote to R.T.E. (national t.v ) asking what it takes to become a commentator and received a nice letter in reply. 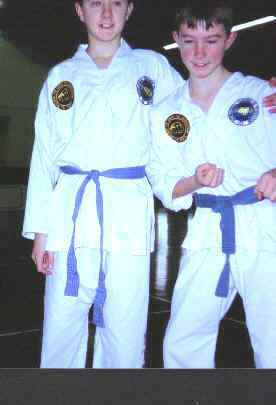 Gary's love for Tae-Kwon-Do surprised us. It became a passion for Gary. Rules governed how each person treated one another. If you had no respect for others then you were out. Unfortunately most other clubs didn't keep these standards and would gladly turn a "blind eye" to the bullying which spoiled the fun for kids like Gary. Gary scores in the mini world cup Gary played for this team. But the team was made up of a lot of boys who bullied Gary each chance they had. One day I dropped the boys off for football training. All I heard from the top of the field you "Bastards"are not playing. I raced up the field and those boys had to retrieve the ball from over the roof tops.